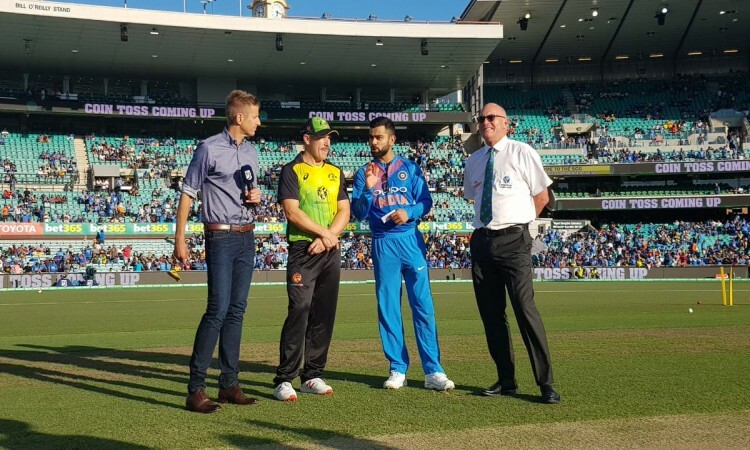 Sydney, Nov 25 (CRICKETNMORE): Australian Captain Aaron Finch won the toss and opted to bat first against India in the third and final Twenty20 International of the rubber at the Sydney Cricket Ground here on Sunday. While the Indian team remains unchanged since their last game at Melbourne, the hosts replaced Jason Behrendorff with left-arm pacer Mitchell Starc. Australia is currently leading the series with 1-0. India: Rohit Sharma, Shikhar Dhawan, Lokesh Rahul, Virat Kohli (Captain), Rishabh Pant (Wicket-Keeper), Dinesh Karthik, Krunal Pandya, Bhuvneshwar Kumar, Kuldeep Yadav, Khaleel Ahmed, Jasprit Bumrah. Australia: D'Arcy Short, Aaron Finch (Captain), Chris Lynn, Glenn Maxwell, Marcus Stoinis, Ben McDermott, Alex Carey (Wicket-Keeper), Nathan Coulter-Nile, Mitchell Starc, Andrew Tye, Adam Zampa.